"100 days of what?" I hear you cry! Well, I've decided to join in with a new project being run by The Great Discontent magazine and Elle Luna. It's called the 100 Days Project and we are being encouraged to 'make' something for 100 days. You can read more about it here and more about Elle here. It begins today so that will take us up to sometime mid July. So, I pondered long and hard about what to do. 100 days of making? Sounds divine, but making what exactly? Dinner?! I definitely do that every day but I'm not sure that counts as a challenge. 100 days of sewing? That would be fabulous but reality says I'd be lucky if this happened once a week, let alone every day. I went all around the houses and came right back here - such lovely things! At the beginning of the year I promised you more loveliness and, as I mentioned earlier, I haven't quite done all I intended. 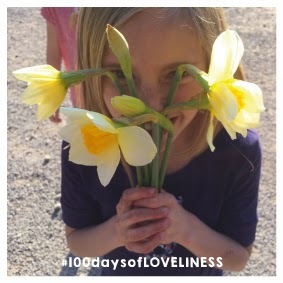 100 days of LOVELINESS is my intent - and I'm determined to stick with it. I'm going to be posting every day on Instagram and on Facebook. If you would like to follow my quest - and offer encouragement - you can find me on Instagram here or using the hashtag #100daysofloveliness or on my Facebook page here. I also hope to bring you a weekly update every Monday. I won't promise! Just to save you hopping around, today's LOVELINESS was an afternoon at Mells Daffodil Festival. The sun shone, not only that it was warm, we were all feeling well (our house had been renamed 'the sick bay' for the last two weeks) and we had fun with our friends at an amazing festival in a tiny village nearby. Check out their website for more details. It was properly ace! And this picture sums it up for me - at the end of a sunny day, a hint of a cheeky grin from my biggest girl, peeking through the bunch of daffs, held by a pair of grubby hands. What could be lovelier?? Thanks, Deb. It's proving fairly easy so far. In fact I could name more than once 'lovely thing' a day at the moment. It might get a bit tougher once the holidays are over and we're back in the daily routine, but I'm going to stick with it. My thoughts exactly! I feel the need to recognise the loveliness, since it's often easy to let it pass us by. Go for it, Jo, great idea! And oh, that pic? Tooooo cute!